Water bottles are bad. We know this, we’ve seen the ads and even more visible we’ve seen the mess in our own backyards. Just take a walk outside and there’s bound to be a plastic water bottle on the ground. What if companies decided to reinvent the water bottle and change our consumer behaviour at the same time? Introducing the Re:Factory water bottle. The product hasn’t actually been created as far as I know but the idea behind the initiative is something I believe worth looking at. The Mechanics: How does this initiative work? Purchase: You buy Re:Factory water bottles at your local grocery store, just like we do with biodegradable grocery bags. Return: When you’ve finished the water in your bottle you bring it back to the grocery store who will then clean the water bottle and refill it. 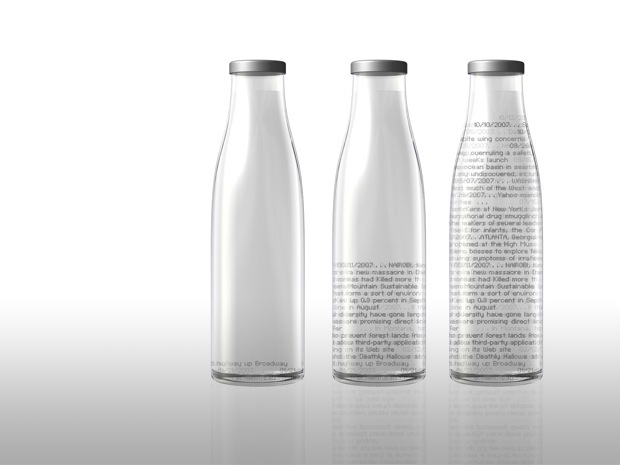 Personalize: What I find most unique about this product is that when each bottle is returned it is etched with words. The plan is to etch news headlines of the day the bottle was refilled. This way a story accumulates on the bottle and makes for a fun personalized read. My only concern would be consumers like me who would collect these water bottles with their artworks and etchings rather than returning them to be refilled. Green: We all know about the green trend, but perhaps its our inherent nature to actually care for others and the society around us. I recently started reading Predictably Irrational by Dan Ariely and he argues that we do care about the world. We have a conscience. He talks about parents who were late to pick up their children at daycare and when the daycare implemented a fee for late parents to reduce the tardiness, parents came to pick up their children even later. The reason was because, when there was no fee, parents felt guilty and tried to pick up their children as early as possible. After the fee was introduced they could pay their way out of this guilt: “It’s ok if I’m late because I only have to pay $5” was the mentality. My point here is that introducing a fee on plastic water bottles would most likely decrease the demand in the short term but in the long term the demand would increase once again. By implementing a “pull” system where consumers want to reuse and refill their water bottles may be the best way to actually reducing our carbon footprint. For my source of inspiration for this blog post see: Changing Consumer Behaviour One Water Bottle at a Time by John Edson.